A bizarre blend of humour and historical fiction, Jonas Jonasson’s novel is laugh-out-loud funny. A girl, born in the slums of South Africa during apartheid ends up saving the life of the King of Sweden, is the straightforward plot, as described in the absurdly long title. But the joy of this novel is in how on earth she ends up in a position to do so, with each twist in her tale more unlikely than the next. This book covers so much history, from the lineage of the Swedish monarchy, to colonialism in Africa, politics and racism in South Africa both during and post-Apartheid, the rise of China as a global power, and the history and movement of nuclear weapons in the 20th and 21st century. It also dabbles in representations of PTSD, art forgery and how to outsmart Israel’s Mossad. In covering so many different topics and weaving historical fact with fiction the novel is occasionally a baffling read, with so many references to different events, only about half of which I was intimately acquainted with. Despite occasionally feeling lost in the whirlwind of content the humour really carried the story for me. The plot is truly absurd, and the intricate way in which all the scenes and characters combine to create hilariously ludicrous situations is impossible to unravel as the build upon eachother from the very first page. 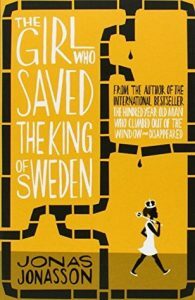 Overall I really enjoyed The Girl Who Saved the King of Sweden, though perhaps not quite as much as The 100 Year Old Man Who Climbed Out the Window & Disappeared. The extended timescale and difficulty in forming an emotional connection with any of the characters is what held me back in this instance. However if you, like me, have an interest in international relations, class politics and revolutionary zeal you might just enjoy this one as much as I did. Suitable for teen and up, though targeted at adult audiences.